One of the most vital parts of getting ready for a craft show is minding your calendar! This is so very important and it’s something that is often forgotten and overlooked as you continue on the daily grind of “life” and even the normal parts of running your Etsy shop. I’m going to try and give you some of my best advice in calendar preparedness and getting ready for your craft show. 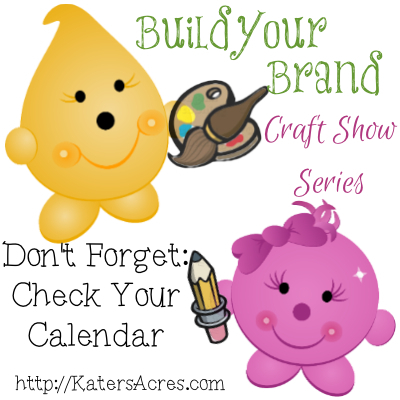 You can’t plan for a craft show any other way than by looking at a calendar. It can be a real paper calendar or a digital calendar. It doesn’t matter, but you need to get one in order to properly prepare and be ready. The last thing that you want is to leave things to the last minute when you’re more likely to be overwhelmed and completely stressed out! First you need to make a list of what needs to be accomplished: production of new items, receipts, new table decorations, order business cards, etc. Decide & write down how long it will take you to accomplish your list of tasks to be done. Add at least 1 month for production of work/pieces that you will be taking this will allow you room for family emergencies, accidental studio mishaps, and whatever else might happen. For example: If your pieces will take 2 months to create, allow yourself 3 months to create your items. Make sure you have enough business cards and add them to your calendar to be ordered at least 6 weeks prior to your show. Do yourself your biggest favor and do not rush and cram for the big show day … work little pieces at a time and you will have much more success.